Mitama festival is a mid-summer festival at Yasukuni Shrine in the centre of Tokyo taking place during Tokyo’s traditional obon festival mid-July (as compared to mid-August in most other places in Japan). Around 30,000 orange lanterns light up the approach towards the shrine. It is one of the most popular festivals in Tokyo attracting more than 300,000 visitors over 4-days. This festival was started in 1947. 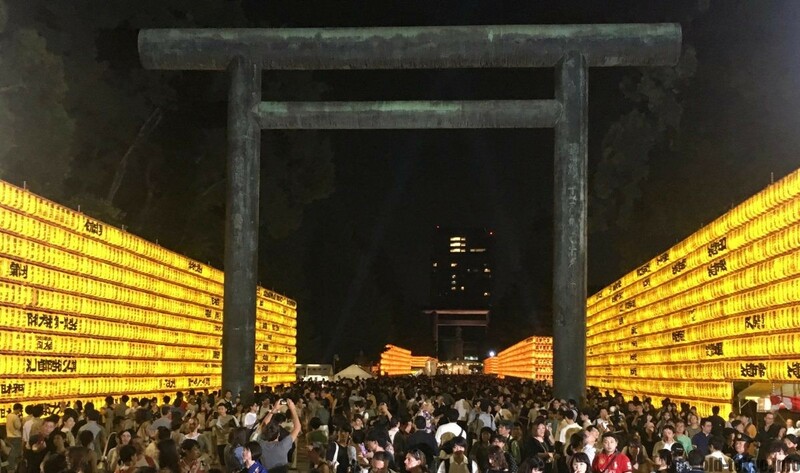 A big festival at Yasukuni Shrine might raise some eyebrows especially in the foreign community in Japan. However, it seems the organising committee is careful not bringing in any controversial messages during the festivities and the visitors do not seem to care. Many foreign visitors visit the festival and particularly young people join the festivities. Many people are taking selfies in this spectacular setting. No Obon festival is complete without the Obon dance. This traditional dance starts each of the 4 festival days around 18:30. Awa-odori is usually also done, but only on one of the 4 days. Mikoshi-furi in which people carry along a shrine and float it up and down to show the turbulent character of the god is also part of the festivities. Even though all these traditional elements are included, Mitama festival feels quite different to other festivals I went to. Perhaps because many of the visitors are young or perhaps because the number of food stalls is rather limited. I have read that they do not sell alcohol at this festival (even though I saw some people with what pretty much looked like beer). The festival is unique due to the vast number of lanterns that invoke a magical atmosphere. There are 2 types of lanterns, big ones along the main approach, and small ones in the side lanes. I somehow found the small ones (rectangle-shaped) to be cuter than the big ones (oval-shaped). 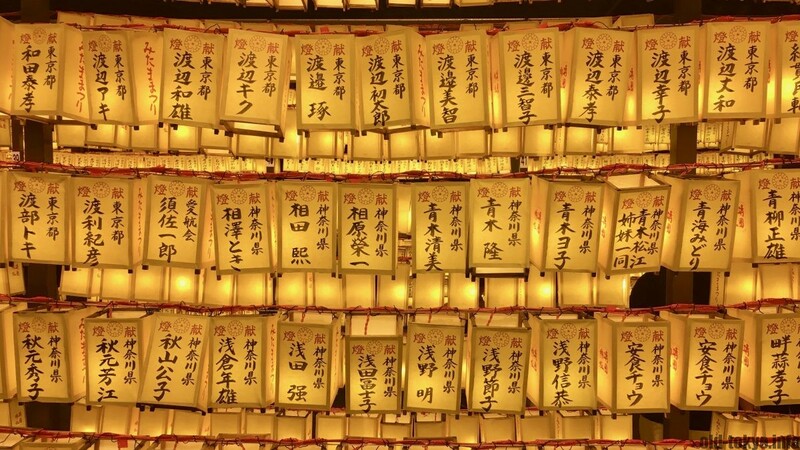 Along the way there are also some areas with calligraphy and images on lanterns. Close the the shrine is a line of very large and colorful fukinagashi streamers with round kusudama on top. 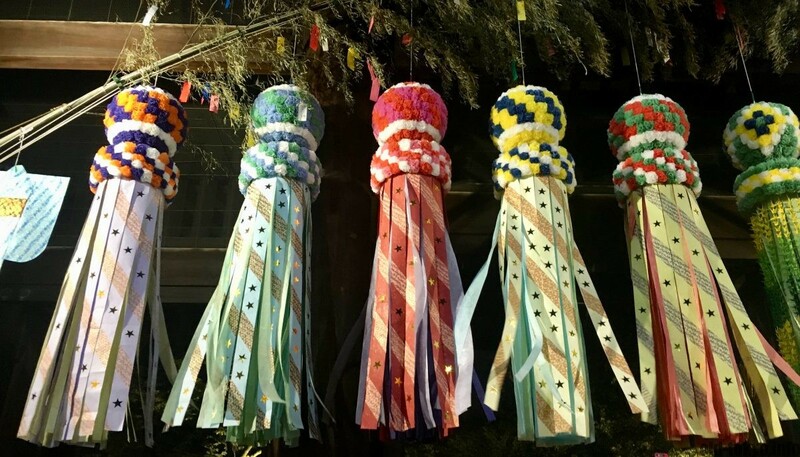 These are actually Tanabata decorations (you can see a tree with tanzaku right above them) and were introduced after World War 2 in Sendai. Obon in July is often intertwined with Tanabata and this shows all the more that cultural heritage is a rather mixed bag with elements from all over the place randomly put together. A good message from the people at Yasukuni shrine. Visit when it’s dark out! Old buildings in Tokyo? Yes, plenty!